Our bodies have two basic rhythms: Alternating & Synchronous. 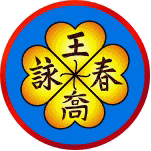 These are expressed in Wing Chun by families of basic patterns. Intriguingly, only one is effective for humans in land travel, but both work in swimming. One basic Alternating pattern is the fundamental high-speed, continuous punching pattern (with different names in different groups, of course). Wang Kiu called it “Ruffle Punching” because it sounds like a basic drum-roll or “ruffle” (as in “ruffles & flourishes”). It shares this rhythm with a generic horse-stance punching, but is faster partly because its movements are shorter (fewer inches of travel per punch). One basic Synchronous pattern is the “PoPai” (various Romanized spellings). This has a number of variations, shown well in Gary Lam’s DVD. Wang told us the name PoPai (various spellings) means “sign holding”. A Chinese tradition of carrying framed pictures of people in parades functions better, is easier, if one hand is at the top of the frame and one at the bottom. That way, hands can switch, reducing fatigue (same as the crane stance adopted by shepherds who switch standing on one leg). FunFact: The PoPai coordinates with similar Synchronous patterns of GanSao (Separating Hand) and KwanSao (Tying-Up Hand) to form what Wang called Wing Chun’s “Three Sisters”. A second Synchronous pattern is the simultaneous “Block & Punch” known as “the Four Gates” (described in Lee’s book). It is like a simple push-up. Like in the PoPai, both hands advance together. However, the hands advance differently: one is more extended for a strike because the opponent’s target is likely farther from us than his punch. A third Synchronous pattern is when one hand retracts as the other advances. Wang called this “GaabLik”. It is the Synchrony of any LopDa (Jerk or Pull and Strike). The timing takes some students a while to get working, which holds interest of its own. The Synchrony is essential to getting the opposite forces to add up, augmenting the force of the hit. It resembles tearing a paper or two cars colliding head-on. A variation on Synchrony is the heartbeat pattern of skill sets like a PakChoi (Slap Block then Punch). It is literally fundamental to our bodies as the two sides of the heart alternate in this way. Referring to drumming once again, the “Lub-Dub” is called a Flam. Like most things that work, this pattern has a practical mechanical reason. Two objects cannot occupy the same space at the same time. The Choi (Punch) replaces the Pak (Slap) to such an extent that it is a Jeet (Slice), obstructing and tracking the incoming punch after the Pak has displaced it. The Pak creates an opening, the Choi uses it. This is not a trivial idea. It is universal. It is seen in large-scale military maneuvers and in one bullet breaking heavy glass to grant another a straight flight path. FunFact: Part of a much bigger pattern discussed elsewhere is the difference between the punching at the end of SiuNimTao (first form) and ChumKiu (second form). The first is on a single central plane, the second alternates between two central planes roughly 90-degrees apart. Wang distinguished the two as “Ruffle Punching” (first one), and “Chain Punching” (second one). He pointed out that they are different mechanically, and that the second hearkens to the shipboard days, pulling up a heavy anchor chain. This is a fascinating topic on its own. So much so that I’ll point you at an entire research reputation built on it in the kinesiology field. But first… “Downhill and Uphill Switching”: I call them that because one is physiologically easier than the other. This is referred to as having a higher or lower “energy state“, meaning that one takes more energy to maintain than the other. Both rhythms have a stability to them—we tend to stay in one until something motivates a change. Two switches are good introductions to early students. Switching from a Synchronous “Upper Gate” to a Ruffle Punch is easy because the Upper Gate is really just a stretched-forward WuSao (Guard) position—one hand is extended more than the other. They begin trading positions, the rear advancing over the withdrawing front, and a Ruffle is “born”. A minor variation that is really exciting to beginners is progressing the Gate to a LopChoi where the withdrawing hand “brings something back with it”. The STEM content of Wing Chun is real. Haken and Kelso * with others published a series of research papers starting in the 1980s applying dynamical systems theory to human motion. They had people put two fists on a table, with index fingers extended. Instructions were to start switching the two fingers side-to-side like windshield wipers (both left, both right). The first exciting thing that happened was when the participants gradually sped up the rhythm. Their motion became unstable then settled into an easier pattern at high speed (both fingers together, both apart). The second was the fact that when they gradually slowed the rhythm again, participants did not revert to the first pattern again. This showed that perfect mirroring in the limbs is an easier (called “lower-energy”) pattern for the nervous system. I just read this and it brings back memories. I’ve been busy but I will email you shortly. Thank you for posting this piece, I very much appreciate it. Thanks for your note! Always nice to hear from UBC. Have you seen my article in latest Wing Chun Illustrated?